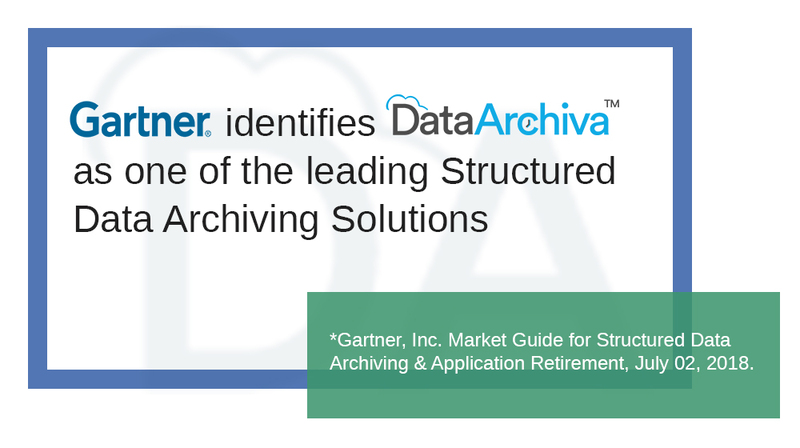 Gartner, the global research and advisory firm has listed CEPTES as a Representative Vendor for their flagship product DataArchiva in their recent market guide for the category of Structured Data Archiving and Application Retirement. According to the report, Organizations are baffled by the high costs and narrow focus of traditional vendor solutions, with an addition to a general lack of awareness of prepackaged solutions available for the market. Gartner recommends I&O leaders to follow a do-it-yourself (DIY) approach where retention periods are short or the data footprint/number of applications is small, and where the cost of a third-party solution outweighs the business value of the data. The report also states there is an increased requirement for Salesforce archiving which is one of the application-related key trends in the structured data archiving market. The reason behind this trend includes cost avoidance as organizations look to avoid paying for additional storage cost and the requirement for greater control of content. Today enterprises are facing tough challenges of effective data governance, compliance, archival, and audit data retention. At the time of choosing the SDA solution, they must consider factors like specific requirements, future needs, and solution provider with detailed domain knowledge. With the introduction of the General Data Protection Regulation (GDPR) in the EU region, the demand and importance of structural data archiving solutions have increased. The increased importance of application retirement as a use case is leading to continued growth in the structured data archiving (SDA) market. Enterprises are increasingly adopting software as a service (SaaS)-based applications. Because of this, it is unclear if the demand for SDA will continue, as this market is in part driven by operational cost containment of legacy applications in addition to governance drivers. The demand for do-it-yourself (DIY) approaches to data archiving is growing because organizations are frustrated by the high costs and narrow focus of traditional vendor solutions, in addition to a general lack of awareness of prepackaged solutions available for this market. As the importance of data in business has increased significantly in the past few years, Salesforce customers are continuously looking for efficient archiving solutions to archive their lesser used data, as additional storage space comes with a high cost. Structured datasets are growing in volume, and the need of the time is a big data system. In this case, Big Object is playing a crucial role in addressing cost factors while offering an analytical solution. DataArchiva is the ultimate Salesforce native application for structural data archiving which is secure, scalable and admin-friendly. This application will periodically archive infrequently used Salesforce data in order to save significant data storage costs. Industry-leading capabilities of DataArchiva may effectively reduce Salesforce data storage cost up to 80%, enhance application performance, integrate live and archived data, power a hassle-free data archival and restore process, and offer data usability and retention management. The application is powered by various robust features and functionalities such as standard or custom object data archiving, status-based archiving, scheduling, API enablement, attachment/file support, data encryption, easy installation & set-up, auditing and much more. You can visit www.dataarchiva.com to learn more about DataArchiva. You can also download the application from the AppExchange here.